Camerons is a Ballarat icon. A family owned company that’s been here for more than 120 years, providing tradespeople and the community with real country service and an eye for quality that regional Victorians appreciate. But we’re not resting on our laurels. Camerons is the go-to for many generations of locals, young and old, who know we provide a great range of quality products and a level of service, convenience and versatility to match. Like easy online ordering, specialised product sourcing, personalised account servicing and (of course) super fast, on-time delivery across all our trade areas of plumbing, welding and industrial, and steel. Our business covers plumbing, steel distribution, and welding and industrial supplies. Each team are specialists in their own right but we all work together to provide our customers with a fully integrated service offering. Each area is well supported by close, long-standing connections with national buying groups. J B Cameron, as we were first known, was established by John Brown Cameron in 1895 to service the mining industry. In 1931, the focus of the business shifted to incorporate plumbing and industrial hardware products. J B Cameron moved to the current position on the corner of Armstrong Street South and Eyre Streets in 1957. Over the years the company evolved into what we are today – one of Ballarat’s largest family owned and operated businesses with a reputation for quality products and service. 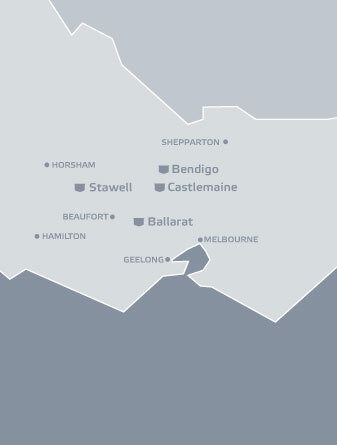 Camerons has a strong presence throughout western and central Victoria. We have a broad and loyal customer base thanks to our well-established stores in Bendigo, Stawell and Castlemaine. Along with our main location in Ballarat, each offers a range of quality products to suit its local community, plus the knowledge, attention to detail and personal service that Camerons is famous for. Our Ballarat store is right in the heart of the city just two blocks south of the Ballarat town hall. For more than 120 years it has been a mainstay of the city – a genuine local business for local people. Occupying an entire block, Camerons has always been a bustling hub. It is a favourite among local tradespeople with an eye for well-priced quality and sought out by home renovators who want real value and service with a smile. At our Camerons Castlemaine store we pride ourselves on providing an extensive range of plumbing, welding and industrial products, along with a selection of general hardware products to suit the local community. Camerons Bendigo store at 120 Hattam Street, is every bit a local institution. A go-to store for all your plumbing needs and accessories, plus the assurance of helpful service and advice from highly experienced staff. Everyone in our Stawell store at 21 Lake Road prides themselves on finding solutions for our customers’ plumbing, welding and industrial needs. Our ability to problem solve across all these specialised areas is what sets us apart, and keeps the local community coming back time and again. Camerons is always looking to make our systems, service and delivery even better for our customers. Part of this is making sure we have exactly what you need – and if we don’t we can get it in for you at short notice.